SAN FRANCISCO: The JA37 Viggen was the most accomplished jet fighter Saab ever built. Now, the Viggen version of Saab's midsize 9-3 series behaves like a jet on wheels, thanks to its high-output turbocharged engine. Saab has been squeezing maximum power from four-cylinder engines for decades, and this time, the result is 230 horsepower and 258 lb.-ft. of torque from a mere 2.3 liters of displacement. Turbochargers often suffer from a momentary lag while they built up boost. The Saab system, however, "fools" the driver by opening the electronic throttle more than the driver requests with pedal pressure. This trick makes turbo charging feel immediate. My Lightning Blue test car wore the traditional Saab styling cues -- a somewhat upright windshield, unique grille, high tail and concealed hatchback. But the Viggen struts with a macho attitude, wearing its bold front air dam, rocker panel extensions, and rear wing, all sitting on 17-inch light alloy wheels with low profile tires. These changes improve airflow around the car, for higher performance, less noise, and greater stability (and a cool look, too). The sport suspension beefs up the springs, dampers, anti-roll bars and steering rack mounts. The few minutes I escaped the freeway showed an extremely poised sports car that cornered and steered with real confidence. Viggen identity is splashed all over the car, from the metal threshold plates to the unique textured seat leather with embossed Viggen delta-wing emblems. The car's leather seat and door inserts matched the bright blue body paint. The shapes inside the Viggen are uniquely Saab, with the traditional flat instrument panel covered in a unique light gray instead of wood grain, flanked by organically shaped door panels. The door handles tilt forward, as if blown over by the wind. It took me about three days to get accustomed to the console-mounted ignition key, but it does explain why the remote locking fob resembles a miniature pontoon. A secret: The transmission must be in reverse before the key will come out! Safety is a major Saab selling point. Saab has studied thousands of accidents in Sweden since 1972 to help design a more effective high-strength steel safety cage and crumple zones. The 9-3 was subjected to more than 40 different crash tests, including the famous "moose test." A hinged side pillar protects head and shoulders from impact. Saab's SAHR active head restraint system is completely mechanical, and pops up the headrest during a collision to catch the driver's head before whiplash can result. The resetable device saves time and big money too. General Motors owns Saab now, so GM's high-tech OnStar system is available in all Saabs for just $895, plus a monthly connection fee. Push the small OnStar button on the dash and within a minute, 24 hours a day, seven days a week, a live, trained operator answers in the OnStar center in Michigan. Just talk into the built-in microphone and the OnStar staffer will respond through the car's stereo system speakers, gladly supplying route information, or directing you to any restaurant, gas station, bank, Saab dealer, or civic structure from a constantly updated database. The kicker is they know exactly where you are because the system uses global positioning. A small button with a red cross summons medical assistance, and the system automatically places an emergency call if the airbags go off in a crash. I placed three calls to OnStar, and found Dan, who explained the system, Tyrone, who provided directions, and Kima, who located a nearby seafood restaurant. 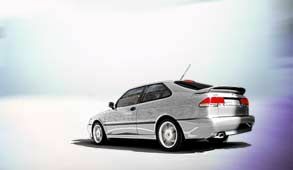 The Viggen satisfies the need for performance, exclusivity and comfort, and has a price tag to match expectations. The coupe and sedan cost $37,750 each plus $500 for delivery charges. Add about $7,000 more for the convertible models. Fuel mileage on premium is posted at 20 city, 29 highway. I averaged 20.1 mpg over about six hundred miles of predominantly freeway commuting. Complaints? Just three minor ones. The front air dam can scrape on low driveways, the car torque steers to the right if you stomp on the gas too hard and the cup holder blocks the radio display. Not bad compared to all the praise this car has generated since its debut. Column Name: "The Viggen, A Jet on Wheels"